The talk this week of a Green party “surge” has reminded me of when the same word was applied to Ukip last year. In both cases I prefer to use the word “skirmish”. A surge implies a consistent and continuous advance. 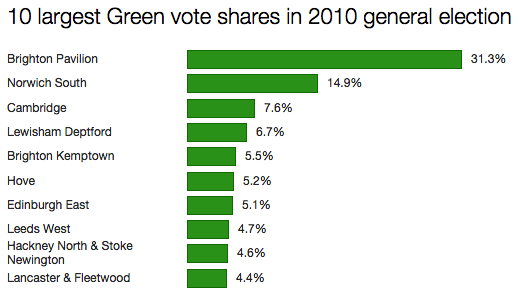 This isn’t what is happening to the Greens, just as it hasn’t happened with Ukip. Still, a carefully targeted skirmish by the Greens could have an impact on the result of the general election, even if it doesn’t end up with the party adding to its current tally of one MP, Caroline Lucas in Brighton Pavilion. First of all, note that the top 10 does not contain Bristol West, the seat the Greens have made their number one target this year. The party actually polled 3.8% in Bristol West in 2010: good enough to secure them fourth place behind the Lib Dems, Labour and Conservatives, but not a great omen for future elections. That all changed when two things began to happen: the Liberal Democrats’ vote started to collapse, both here and across the country, and the Greens started winning seats on Bristol city council. Their current total is six, which might sound impressive, but that’s six on a council of 70. Nevertheless an assumption that disillusioned Lib Dem voters have been turning to the Greens rather than to Labour, compounded by a more recent belief that disillusioned Labour voters are now also switching to the Greens, has made the constituency of Bristol West top of the Greens’ hit list. Darren Hall is the party’s candidate, and he needs a whopping 22.1% swing to take the seat. Going back to the top 10 list from 2010, it’s significant that all three Brighton constituencies appear: Pavilion, Kempton and Hove. All three were Labour seats until 2010. Labour is desperate to retake at least two: Kempton and Hove. But the Greens’ relatively strong showing in 2010 suggests we might see a split in the left-wing vote here, which could allow the Tories to hold the seats. Given Labour needs a swing of only 1.6% to take Kempton and 1.9% to take Hove, the party would be furious if an increased Green vote denied it the chance of two theoretically easy wins. I don’t think Labour need worry about a similar trend in Norwich South, where it needs only a 0.3% swing to retake the seat from the Lib Dems (though note the Greens currently hold 15 of the council’s 39 seats). Cambridge is a different matter, however. It would be a brave person indeed to predict with confidence what will happen here, with both the Tories and Labour jostling to take the seat from the Lib Dems’ Julian Huppert, a huge student vote that could split in a number of directions, and one of Ukip’s most high profile candidates (Patrick O’Flynn) also in the mix. Of the other seats in the top 10 from 2010, the two in London – Lewisham Deptford and Hackney North & Stoke Newington – will both be held comfortably by Labour this time. The same is true of Leeds West. But Lancaster & Fleetwood will be very interesting to watch. It’s a top Labour target, won by Eric Ollerenshaw for the Tories in 2010 on a majority of just 333. If the Greens do well here at the expense of Labour, it might be another instance of the left-wing vote splitting enough to allow Ollerenshaw to survive and for an otherwise simple gain to slip from Labour’s hands. Labour would be even more incensed over this outcome than at missing out on the Brighton seats. As for Edinburgh East, a potential five-way battle between Labour, the SNP, the Lib Dems, the Tories and the Greens is going to make this seat one of the most intriguing in all of Scotland. My instinct is still that the Greens won’t win any more MPs at this election, but that Caroline Lucas will be reelected in Brighton Pavilion. The Greens may influence the overall election result by denying Labour a handful of key gains, however – a prospect which the Conservatives would understandably relish, and which is surely informing David Cameron’s behaviour over the TV debates.